I'm a bit of a sucker for 'best of' posts at the end of the year. But I didn't know if I wanted to write one myself and so I asked on Twitter if I should-and got a 100% 'yes' response. Instead of doing my favourite products of 2016 I decided to follow Jo from A little pop of coral's lead and do my own personal favourite discoveries of 2016. A lot of these products aren't new launches, they are things I started using last year and fell in love with. They've also worked out to be a good mixture of high end and drugstore. If I did have to talk top 3 ultimate faves of 2016 they would be (just so you know) Love Liberty lipstick from Charlotte Tilbury (review! ), the Trish McEvoy 24hr shadow and liner sticks (review!) and Jo Malone Ginger Biscuit cologne (review!). But all three of these were pre-2016 discoveries and therefore I'd be cheating if I included them! I also do a monthly favourite post. If you select 'rave review' from the categories tab at the top of my blog you can see month on month the things I am loving using. 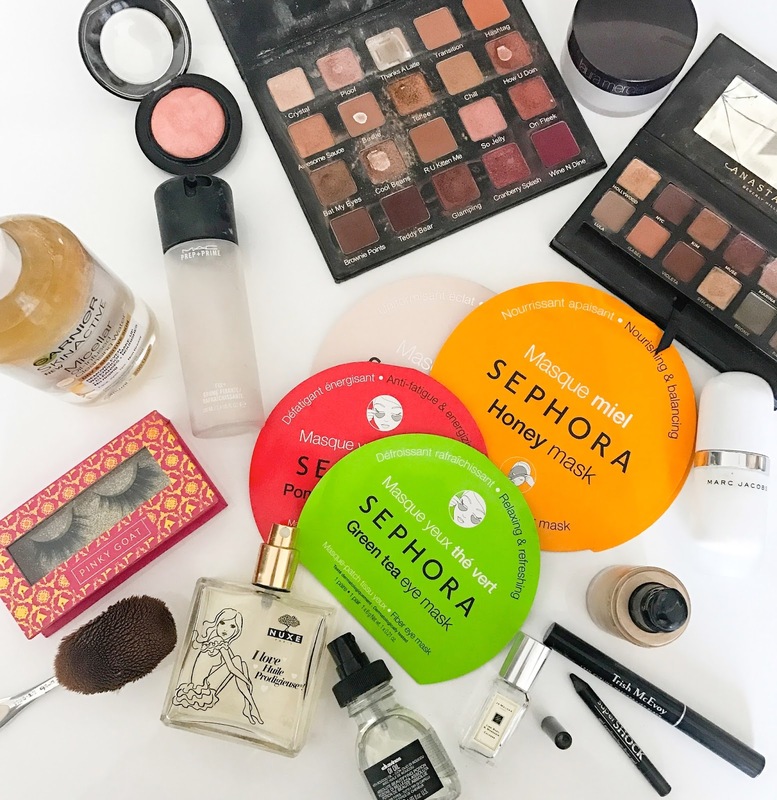 So in no particular order, here are my personal, top 16 beauty discoveries of 2016. I truly love this because I am so bad at eyeliner yet this pencil just glides on and stays on. It doesn't smudge or migrate and I find it's such a deep black that my eyelashes look instantly more volumised at the lash line. I would never have tried this, it was a gift from my god daughter Leah and I love it. For £3 it's a total bargain too. This is my current mascara and new obsession. I feel like I have struggled all year with mascaras flaking and smudging on me and I was getting really sick of it. I decided to try this Trish McEvoy tubing mascara after hearing Tiffany from Make Up by Tiffany D rave about it and I absolutely love it. I've tried tubing mascaras in the past and actively disliked them-you don't remove them with normal eye make up remover but just by rubbing your lashes with warm water and easing it off with your fingers. Sounds weird, is a bit weird yet strangely satisfying. This mascara does not smudge. It does not flake. It will not leave you with dark cirles under your eyes by mid afternoon. It has quite a wet formula initially and doesn't have a scratchy brush (my pet hate). It really separates lashes whilst adding volume and length. Trish McEvoy is a really underrated brand that I have loved for almost 20 years. I love this mascara so much that I bought two back up tubes of it in the UK. My favourite formula discovery of the year, I really liked this slightly heavier textured, medium to full coverage foundation. I felt it lasted really well on my skin and it was the foundation I reached for if I wanted the most flawless finish on my skin. I realised in 2016 that my skin loves a good, liquid foundation with a decent density-these new pigmented but watery formula foundations do nothing for me. The shade range was a little off for me, a lot of the shades run yellow toned but I could make it work by adding a drop of a more pink toned foundation. I thought I was totally in love with the Too Faced Hangover primer but then I tried this and I quickly switched allegiance. I know a lot of people tried and loved the Nivea for men aftershave balm as a primer and I too jumped on the bandwagon. But I never felt that 'tacky' texture people spoke about that made your make up cling to the primer and therefore to your face. Until I tried this. And then I got it. I love the way this feels on the skin. It really feels like you are laying down a solid base and my make up applies so nicely over it-and it stays on. I am a terrible 'face toucher' through the day and by the end of it my make up generally disappears from the lower half of my face. This doesn't totally mitigate that, but it helps a lot. You would be forgiven for being sick of me banging on about how much I love this but this palette is truly amazing. I have hit pan on no less than 6 of the shades-and if you know me, you know I own a fair few eyeshadow palettes. I love the combination of colours, the fact you have a well rounded palette of matte and shimmer shades, the blendability and the staying power. I adore it. This palette has been on endless journeys with me and is utterly filthy. But you cannot go wrong with it. I have done a full review here. A more recent edition but the only other palette I continuously reach for is the Master Palette by Mario. This palette is a lot more, dare I say, boring in tone than the Violet Voss but everything just works. The finish of the shadows is utterly beautiful, I love the almost metallic finish to the neutral tones. The shadows also apply like a dream. They feel slightly denser than the Violet Voss ones and give a more opaque 'wet' look in some instances and again, I just can't fault it. Favourite shades are Kim, Muse and Paris. I was really late to the party with this discovery which has been a bloggers fave for years. Very simply it smoothes and evens out your skin tone as well as setting your face and is one of the best loose powders I have ever tried. I've run out and need to repurchase asap. Nuxe Huile Prodigieuse is my absolute favourite body moisturiser. I just love how soft my skin is after using it and how it absorbs so easily-I literally slather it on. I love how it's not tacky and leaves the most beautiful sheen to the skin. I also adore the packaging and the spray pump means it is totally hassle free to use. The Garnier Oil Infused Cleansing Water is my current favourite eye make up remover. I love using micellair waters to remove eye make up but never use them to remove my actual make up-I really do prefer to properly cleanse my face. But I find this cleansing water brilliant at removing eye make up-the oil infusion really helps to break down stubborn mascara and it doesn't irritate my eyes in any way. Compared to other bi-phase make up removers I have used, this one leaves the least amount of oily residue but I do remove my eye make up first and then properly cleanse so the residue isn't an issue. And the price point is phenomenal-I picked up 3 more of these big size bottles in the UK for around £3-4 each. Sheet masks to me are the ultimate lazy skincare treat-they're quick and easy and there's no mess. I love the Sephora ones for face and for eyes and they're really cheap-around $5-plus there is one for every skin related concern. I also love that they're so portable, I always have one or two in my toiletries bag when travelling. My best friend Dani recently shared a great tip with me for sheet masks-if you find they're too big for your face just cut them up into sections and position them on your face to fit-genius! The Sephora ones are quite 'wet' in texture so I tend to lightly squeeze out the excess before applying the sheet to my face. They all feel really cooling on the skin too. The other reason I like them is because they force me to stop for twenty minutes and relax-I am someone who struggles to sit still and not do anything and am forever multi tasking-but with a sheet mask you can't do that because invariably if you try and rush around doing 6 million jobs whilst wearing it, it will just fall off! When I remove the mask I tend to just massage any excess product into my skin-the red pomegranate one is my favourite! You will however look scary when wearing any kind of sheet mask-just embrace it. Obviously MAC Fix Plus has been around forever but it was only 2016 that I discovered how good it is. I owned a bottle but never really used it. I really got into it when I heard Laura was using Marni's tip to add MAC pigments to Fix Plus to add an extra glow and dewiness to the skin. Then when we met up for our Christmas lunch, Laura's excuse for being late was that she was spritzing Fix Plus between every layer of make up! And I've been since doing that a lot and it really does help to keep your make up on your face. I have one bottle with a mixture of a teaspoon of Vanilla pigment and a teaspoon of Tan pigment (both from MAC) in it and one bottle just plain. It has a multitude of uses-spritzed over face as a primer, a setting spray, to dampen brushes to intensify colour, to sheer out an over powdered face etc etc-I use it for all. The ones with the pigments in it can be spritzed on legs and arms for a little extra glow too. I already have two back up bottles at home. One of my favourite blushes of the year and I have Kirsty and Leah to thank for the enablement. Last year I found a love for glowy blushes-those that you don't really need to add an additional highlighter on top (although I probably do anyway). Dare I say, a frost finish almost. How 1980's. And I always seem to veer towards the peachy pink tones-this year I've loved the By Terry Light Tan Vibes palette (review! ), Urban Decay Hush (review! ), By Terry Platonic Blonde (review!) and then this little beaut from MAC, New Romance. The Mineralize formula is quite sheer but definitely buildable and it has a wonderful glow to it. It is frosted and I recommend a light hand initially until you work out your acceptance levels towards frosted finishes but it is extremely flattering and unlikely to emphasise enlarged pores. It does also run quite warm but Mac do a whole array of shades in this formula if peachy pink is not your bag. My best lash discovery of 2016 was definitely the brand Pinky Goat. Pinky Goat is a lash brand exclusive to the Middle East and I strongly suggest popping into one of the Wojooh stores (which are in most malls here) to check out their stand if you're in the UAE. I had never even heard of this brand, my friends Sarah and Aimee were visiting and said how amazing they were-so I jumped on that bandwagon immediately. I'm definitely a lemming rather than a trailblazer. I really love these lashes because they're so easy to apply-and I am so terrible at applying lashes normally. They have so many styles and they're not too over the top. They're also at a good price point, they offer synthetic and mink lashes and they can be used multiple times. I love the 'Areej' lashes but I did go a little crazy and buy almost one of each style-a girl needs choices! My first ever product from Davines and I still don't really know how I even own this because I would never have bought an oil for my fine, limp hair. It must have been in a beauty box or a gift with purchase. Anyway, this oil is truly amazing if you have fine hair that gets a bit flyaway. Or if you look at your hair midday and there are bits sticking out everywhere. Or if your hair is looking dry and damaged at the ends. My hair ticks all of those three boxes. I like to use a texturising spray in my hair at the roots but it does obviously rough up your hair a bit. One tiny pump of this oil smoothed through the ends leaves my hair much sleeker and smoother and healthier looking. I'm obsessed! I actually left the bottle I had at my friends house on Xmas eve so googled a London stockist and picked up two bottles from Liberty when I got back to London. It's life changing stuff. But expensive. About £32 a bottle. I use one drop a day and I reckon this could last me a year so that's only 8.7p per use. Yes sometimes I justify my purchases this way. Jo Malones signature fragrance but new to me in 2016. Although I don't have a good sense of smell, when I wear this fragrance I always, always get compliments. Every single time. And because when you have no real sense of smell you become paranoid about the way you smell, compliments about smelling good are massively appreciated! I only have this mini bottle and it has about 2 spritzes left but the 30ml size is definite on my 'to purchase' list. I'm told it's so fresh and clean. Top notes are lime, mandarin orange and bergamot; middle notes are basil, lilac, iris and thyme; base notes are patchouli and vetiver. I adore Jo Malone as a brand-I love the fact they're now engraving the bottles, I think that's such a wonderful personal touch to any gift. My final beauty discovery of 2016 was a brush from Artis. At the beginning of the year I purchased a set of Artis brushes but I actually never use any of them. They're all a bit weird and odd shaped. I bought the set because I thought it contained the big face brush but when it arrived, the brush was a lot smaller than I expected. So I went and bought the Artis Oval 10 which is huge and perfect for applying foundation. My foundation application literally takes seconds. The bristles on this brush are so soft and so tightly packed that your foundation just glides over your skin. One thing I don't like is that the brush is a nightmare to wash because of it's density but I can live with it. Again, these brushes are pricey, but should last a good few years. Yes to this trend! I loved having chrome nails for the festive season. Rose Gold all the way! I have had mine done at We Nails and Sisters Beauty Salon in Dubai. My lashes will not curl with an eyelash curler. They are stubborn and misbehaved. The LVL lash treatment is a semi permanent lift to the lashes that can last up to 10 weeks. During the treatment the therapist will separate out all of your lashes to get the most wide eyed, fluttery look and I really love the effect. I've had lash extensions in the past but I hated the upkeep and the fact you can't wear mascara. To me, applying mascara is a daily ritual I enjoy so LVL is a nice compromise. My eyes look much more awake when I have this treatment-you can see how lifted my natural lashes look following the treatment in the middle picture below. I entered into the world of aesthetics at the end of 2016, having Botox and Fillers for the very first time and I am loving the results. I've written a full post about my experience at the clinic I went to in London and you can read all the details here. I'd love to know what your favourite beauty products of 2016 were and also if you've tried any of these products?